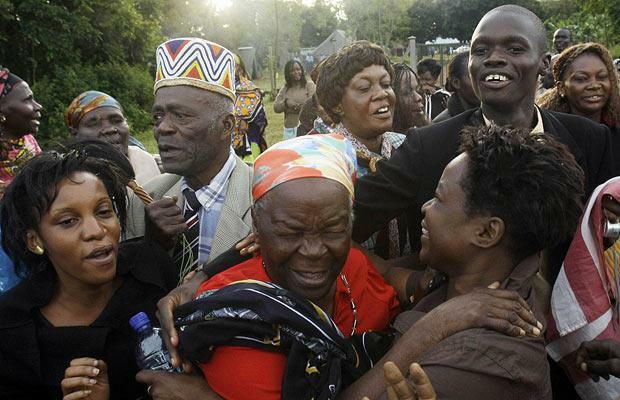 In the west­ern vil­lage of Koge­lo, where the president-elect’s late father was born, Obama’s step-grand­moth­er and oth­er rel­a­tives poured out of their rur­al home­stead to cel­e­brate a man seen by many Kenyans as a ‘son of the soil’. With hula dancers, ecsta­t­ic chant­i­ng and some rock ‘n’ roll, a Japan­ese town named Oba­ma rejoiced as its acci­den­tal name­sake was elect­ed pres­i­dent of the Unit­ed States. At Obama’s for­mer school in Jakar­ta, Indone­sia, chil­dren cel­e­brat­ed the elec­tion result. You may check out more pho­tos (and the sto­ry behind them) by going to Telegraph’s col­lec­tion of Peo­ple Around the World Cel­e­brate Barack Obama’s Elec­tion Win” .